Suffix Digital Task Card Bundle: 3 Boom Card Decks! 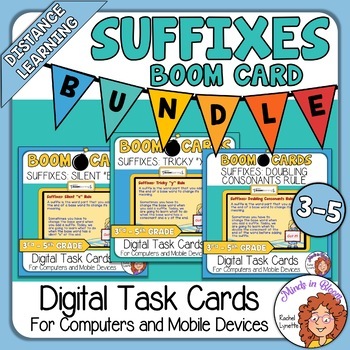 This bundle of 3 sets of digital suffix task cards is played on the Boom Learning℠ platform and will work on any device - Smartboards, computers, and tablets. Each deck teaches about a different rule for adding suffixes and offers plenty of practice as well. The rule is explained (with examples) on the first few cards. The remaining cards are practice cards. There are three levels of practice in each deck. No printing, cutting, or laminating, just assign the decks to your students and you are ready to go. Students get immediate feedback on their progress and you get a suite of teacher reporting tools. Fun, effective, and easy to use. Perfect for the paperless classroom.